You may have already gathered that I am preparing for a new arrival of the small human variety (due in just two weeks!). This has given me the opportunity to work on a creative project of a different kind – the nursery – which I have just finished with a little time to spare. We decided on the mountainscape because Mr Suzie is a keen skiier and we do both love an alpine landscape – hopefully the small human will too. The nursery is a small room so the challenge was to add interest without making it ‘fussy’. 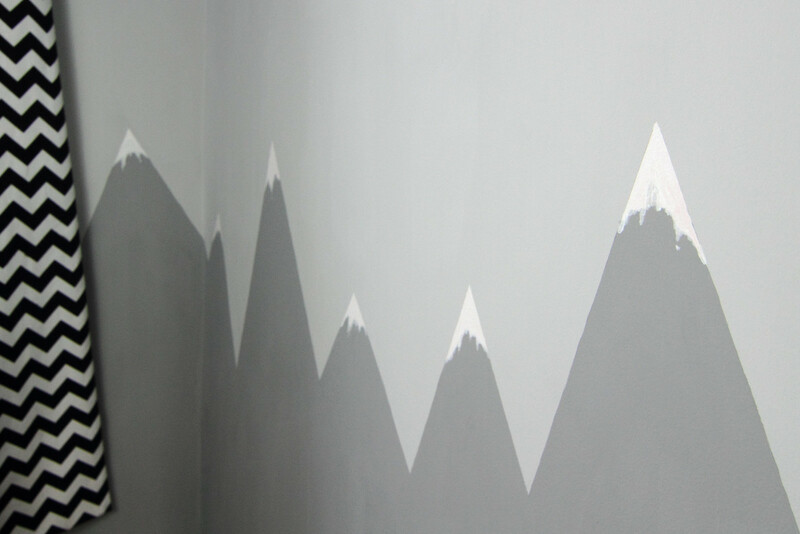 The stylised mountains were easy to create with tape and off-the-shelf paint colours. The clean and neutral greys give us plenty of scope to add colour. Walls prepped. It was asked whether this WIP was in fact a representation of the fluctuations in the GBP, but obviously it’s trending in the wrong direction. 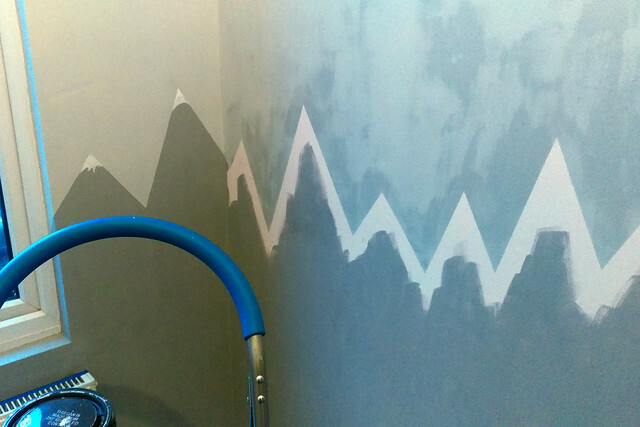 As with all decorating projects, the prep work took longer than the actual painting. 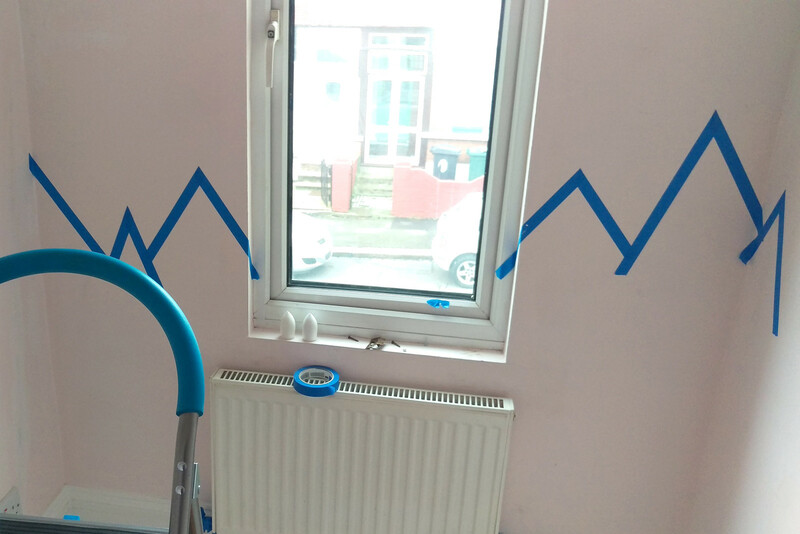 There were many annoying things stuck to the walls including gluey pads (the glue had to be sanded off) and those vinyl wall decorations (for the record, they DO leave a mark when removed and they also take several layers of paint with them, AVOID!). The woodwork was a mixture of old and skirting with many layers of paint, and new unsanded timber mouldings. We moved to this house just before Christmas, and like any Victorian house, no matter how finished it may look there are unwelcome surprises lurking just under the surface. 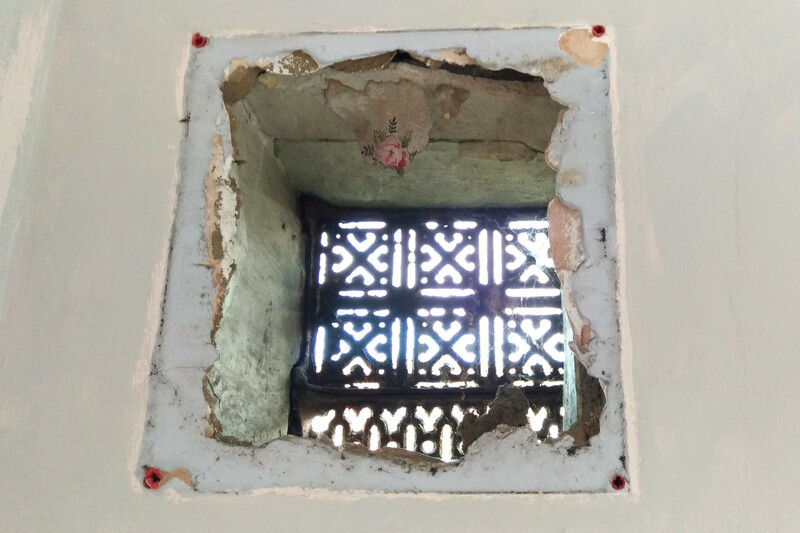 On removing a grubby plastic vent cover I discovered an alarmingly large hole with only an old iron air brick between the room and the outside world. Curiously, it had been wallpapered on the inside at some point, and it looked quite pretty but totally unsuitable for a child’s bedroom. Fixing it involved inserting a much smaller, filtered vent, which blocks noise, dirt and drafts but allows moisture to escape, filling the remainder with expanding foam (horrible stuff), and covering with a nice new steel grille. Filling, sanding and priming and pre-work seemed to go on for weeks (probably because it actually did) but eventually I got to the fun part. The pale grey sky was done first, then the tape removed and the darker grey mountains hand-edged (never put masking tape on new emulsion unless you want to re-do your emulsion) then the snow caps added. I’m lucky enough to have a steady hand, but also invested in good brushes, which make a big difference. I use oil painting brushes rather than decorating brushes for fine detailing. 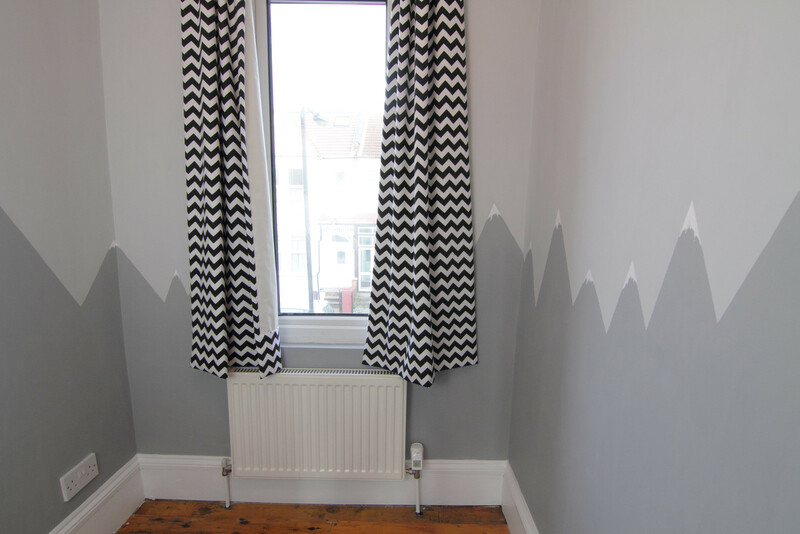 The curtain fabric was chosen both to echo the angular peaks, and because I wanted to give the baby something fun to look at during the time its vision is developing and it can only make out bold contrasts. I found this lovely upholstery fabric on ebay for £12/m and used blackout lining (also from ebay). Total cost for the curtains was about £35, which I think it very good considering the quality of fabric and that the window is very tall. It’s been quite a while since I made any curtains, or sewing of any kind for that matter, and I made a very silly mistake that led to the pattern not lining up first time around. My motto has always been “measure once, cut twice” because I never seem to learn. I added some nice lighting to finish off the room. 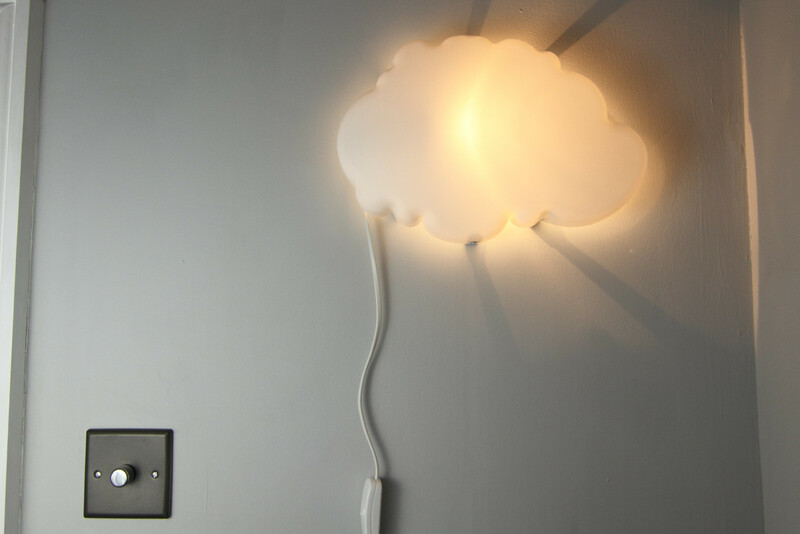 This cloud mood light was £7 from IKEA. 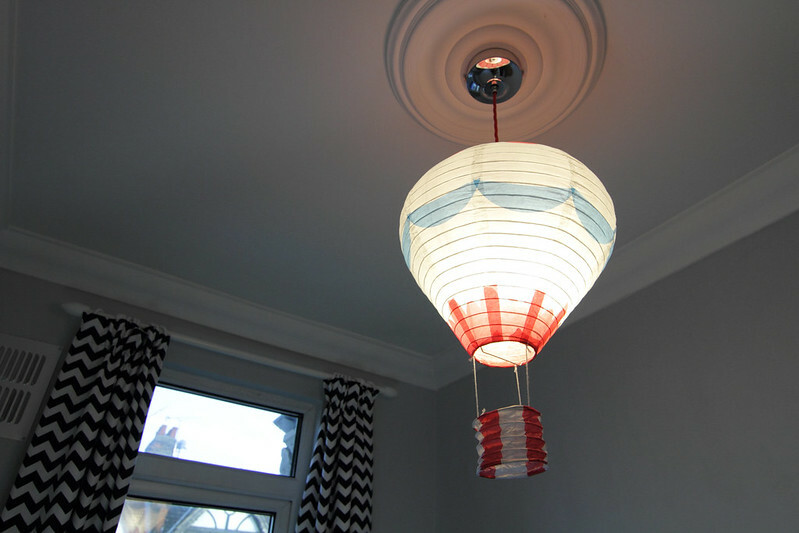 The main light was a discoloured old plastic pendant which I replaced with a chrome ceiling rose and lamp holder and some red braided flex. A paper hot air balloon completes the sky and a lovely subtle glow. All the fittings I used here were found on ebay for a total cost of under £30. It’s been a satisfying but slow project. I have only been able to spend about an hour a day on it because pregnancy has been, well, challenging. I am looking forward to no longer being in this state and being able to show the new arrival their lovely room. Blog Yarn store update, Pussyhats and yarn bargains! It looks lovely, what filter did you use for the hole it the wall? I was worried about sealing the hole up entirely in case it’s there for a reason (i.e. to reduce condensation or provide enough fresh air in this small room) so I felt this was a good compromise. It was a bit pricey for what it is though, and I only used the middle part of the case and the filter. With hindsight I’d have just bought the filter and made a duct for it. the steel vent cover was from Screwfix: http://www.screwfix.com/p/map-vent-fixed-louvre-vent-silver-229-x-229mm/39476 They have a number of different sizes and finishes.